There are going to be a lot of times that you are studying with friends in a coffee shop. You don't want to be the only one that doesn't have a college backpack for their study accessories. You will want to make sure you have a college backpack to carry your study accessories in to ensure that you make it the coffee shop with everything you meant to bring with you. After all, if you're carrying those dorm items in your arms, it can be all too easy to drop and lose those items along the way. 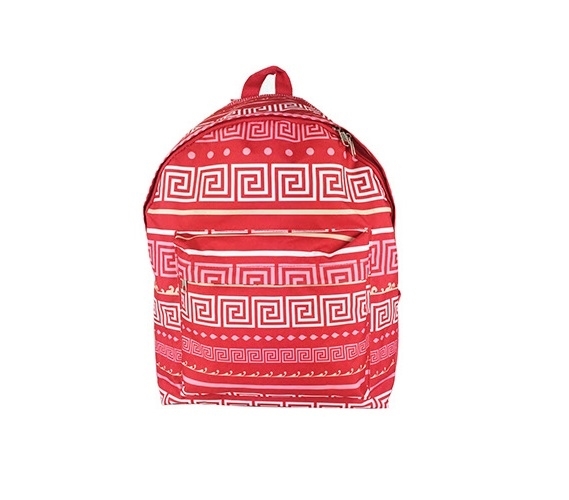 Make sure you are going to your study sessions prepared with our Greek Key Pink College Backpack. Our Greek Key Pink College Backpack has a pretty design that will add extra trendy style to your outfit as well as make your study session more fun with the fun, bright pattern. This dorm essentials item has a large main compartment that will keep your tablet or iPad and notebook separated from your writing utensils. You don't want to have to search throughout your entire notebook for your rogue pen or sticky notes. This dorm necessities item will keep your writing utensils in their own designated accessory pocket. Avoid having to ask a friend for a highlighter because you can't find yours with our Greek Key Pink College Backpack.